Just because the holidays are over, it doesn’t mean giving is. 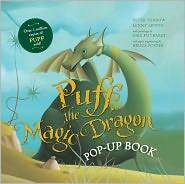 That’s right, we’re giving away another copy of Puff, the Magic Dragon Pop-Up, which we shared with you earlier last month. The book is an expanded edition of the much beloved book, Puff, the Magic Dragon, inspired by the song written by Peter Yarrow and Lenny Lipton (and of course, made famous by Peter, Paul and Mary!). We’ll pick one random winner from our commenters. To enter, tell us about your favorite dragons! The contest runs through Monday, January 7th! ← The GeekMoms Podcast #12: Pokemon, Sportsmanship and Genetics? Puff was my first dragon, so he holds a special place in my heart. But I really want a dragon from Pern … or at least a fire lizard! I love the movie Mulan and Mushu! I’ve got to go big and bad for this one: Smaug from The Hobbit. He might’ve even been the first one I was introduced to in literature, since my dad read that book to me and my brothers when we were pretty little. And that’s also been my greatest disappointment with the info trickling out about the movie: no sign of the dragon. Though considering the split into two films, the first is probably going to end before (or just as) the band reaches the Lonely Mountain. So two whole years before laying eyes on Smaug the Magnificent. Hmmm. I have a dragon puzzle hung on my wall that is made up off smaller dragons. I also enjoyed reading the Rain Wilds books by Hobb. My son Sean is a dragon expert!! Our lives have been full of dragons for 12 years now. Sean has assembled a large collection of everything dragon-related – shelves full of plastic figures of every breed, books about every aspect. AND we have beautiful, meticulously crafted stained glass panels made by my mother. But would you believe we don’t own a copy of Puff the Magic Dragon?! If I win, Sean can add the copy to his collection. Cheers! I love the dragons from Patricia C. Wrede’s Enchanted Forest Chronicles. Dealing with Dragons was the first fantasy book I ever read, and I can’t be thankful enough for it. Even though they’re young adult fiction, I still love to pull them out read them at least once a year. My kids’ current favorite dragon is the one at the beginning of “The Magic Flute”. I have a soft spot for the dragon from the Disney movie Pete’s Dragon. My elementary school used to show that video every rainy day recess session. I love the dragons in the Earthsea books! Ooh, I shouldn’t have read through the comments before posting, now I’m torn! I love Smaug, but right now I am re-reading the Dragon series by Anne McCaffrey because she went ‘between’ recently, so all the dragons there, but especially Ramoth, are my favorite right now! I loved Elliot from Pete’s Dragon! I love dragons of all types, but I’d say my favorite either has to be Faffy from Dave the Barbarian or Dunkelzahn from the Shadowrun RPG. Falkor (the luck dragon) from Neverending Story. My favs have to be Anne McCaffrey’s dragons– her books really got me hooked on sci fi/fantasy books. When I was very young, I remember the music from Puff the Magic Dragon song being so soft and enduring that it made me feel like crying. As I grew up I owned a water dragon lizard. Her name was Puff the Magic Water Dragon. But now the new dragon loves in our lives are “Toothless” from Dreamworks How to Train Your Dragon and Spyro from the new Activision sensation, Skylanders, Sypros Adventure. My boys would love Puff the Magic Dragon! It would be neat to share something like that, that I remember from my childhood, with them! Let’s go old school and somewhat obscure, my favorite dragons are from a series of kids books called My Father’s Dragon (which you can find online here), Elmer and the Dragon, and the Dragons of Blueland. I would have to second Smaug. While I was already interested in dragons prior to reading The Hobbit, Smaug was the first that had a name and was more than a fancy dinosaur. My favorite childhood stuffed animal was Figment, or “Figgy,” from Disney’s Epcot. We went when I was in the second grade, and he came home with me then. Besides that, I loved the movie _Sleeping Beauty_, and so Maleficent comes to mind. Puff is my personal favorite. I have fond memories of Peter Yarrow singing for us at summer camp. My sons favorite is Toothless from How to Train your Dragon. He has the whole series of books, including the most recent that is currently only released in the UK. My daughter’s favorite is Bella, from her favorite iBook!